We set out bright and extremely early from Newbury to get to Streatley Youth Hostel by 6.45 in time to take the bus all the way back to Overton (near Avebury). There we met up with Andy, and Marion, who had decided to come along, “just for fun”. El presidente Dan was notable by absence, apparently suffering a bout of hydrophobia or simply unable to get out of bed at 5.30am. (Editor’s Note – he has an excuse, but why let the truth get in the way of the story?) The weather forecast had threatened heavy showers, but as yet, the sun was shining. 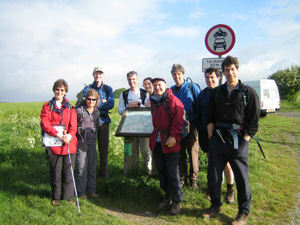 After a happy “before” group photo, we started the walk at 8.06 with an immediate uphill – to warm up those legs. 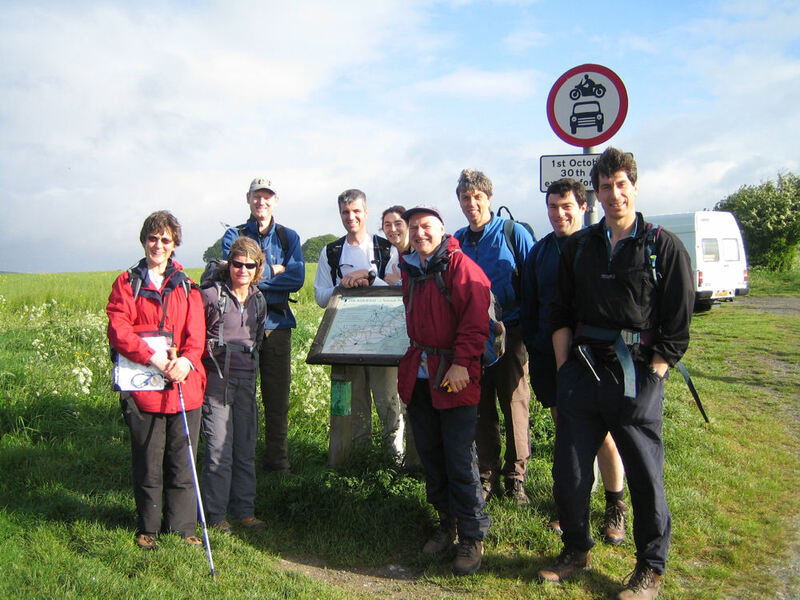 This had the immediate effect of separating the racers from the steady walkers, and Richard N, Steve, Mike and Gaby forged ahead at a positively breakneck 4.1 mph. Waterproofs and even outer jumpers were shed, and the brisk tailwind undoubtedly helped! A strong south wind blew the rain clouds quickly over us, so when it did rain it was only for a short time. Frustating, because as soon as coats were taken out of bags and put on, the rain stopped. Checkpoints were passed, and in time the average slowed down to a meagre 3.7 mph, caused by a slow slog up 100 metres straight to a big antenna. More hills followed, despite Richard’s previous assurances that the Ridgeway was more “undulating” than hilly, and it was thirsty work in the continuing sunshine. Gaby slowed the team down further by feeding the pretty shire horses, and Steve was so intent on reaching the lunchtime pub that he didn’t even notice the car hanging in a tree on the opposite side of the road when crossing the M4 (using a flyover). Both teams met up briefly for lunch at the Shepherd’s Rest, the first leaving as the second settled down for a well-deserved sarnie/pasta/etc. Nobody complained of blisters at this stage but there was emergency cutting of toenails by Dave while others ate their lunch. No crunchy bits added! The morning’s punishing pace took its toll, and the average was reduced to a paltry 3.5 mph. The midway checkpoint at the Uffington White Horse was reached in a respectable 6 hours, by which time Gaby was rather losing the fun aspect of the walk, and was looking forward to retiring at the next checkpoint! The weather was turning as well; heavy showers were racing up from behind. Drenched trousers and slippery wet chalk sticking heavily to boots made the walking rather miserable. Gaby and Marion retired at 23.5 miles due to blisters, and congratulated themselves on their wise decision when they were driven home by Marion’s obliging husband Mark through a deluge of biblical proportions. Alas, no such luck for our intrepid walkers! At 4 p.m. the heavens opened on the remaining gallant crew and they got an hour of torrential rain. Luckily Steve, Richard N, Dave and Andy arrived at the 28-mile checkpoint during the hour and got some shelter. This is probably the last point where a competitor may be tempted to drop out voluntarily, so it was equipped with hot tea and homemade cakes to fortify the spirit. Richard N doesn’t eat cakes, so 4 of them later, he and Steve set off on the last 12 miles. The pace dwindled further, but luckily the batteries of the GPS gave out so they couldn’t tell how slowly we were going. Eventually the A34 was crossed and the finish beckoned. Throughout this time Steve and Richard were dogged by a St John’s Ambulance which kept turning up at checkpoints just as they arrived (was this a sign?) and it appeared again where the Ridgeway track turns into a tarmac road 2 miles from Streatley. Half a mile later, Dave and Andy breezed past them as fresh as daisies, to achieve a finish time inside 13 hours. Steve and Richard N finished in just over 13 hours (so average speed down to about 3.0 miles an hour), with Keyna and Richard S finishing in just over 13.5 hours. Mike had finished at 7.45, slightly chilly and suffering from trenchfoot after walking 17 miles in soaked boots, vowing never to be so stupid again. Everyone got a certificate, tea, more cakes and a chance to seize up at the end, making the procession of Keyna and the 2 Richards back to the car look like one of those old films about First World War soldiers staggering off the battlefield. “Never again” was not heard to be muttered, but several of the competitors have formed a steely determination not to be foolish enough to try the Bullock Smithy!